Design Islands is a unique display system composed of eight modular benches, each representing an island in the Hawaiian archipelago. The islands hold vertical frameworks for the display of artwork. Design Islands are reconfigurable, portable, placemaking devices that frame public space and provide communal seating for both indoor and outdoors installations. Design Islands is traveling to locations across Hawai‘i, having already also been displayed at AIA Honolulu’s Center for Architecture, the University of Hawai’i at Mānoa’s School of Architecture, the Hawai‘i Convention Center, and the Hawai’i State Capitol. Inspired by the SoA’s open-source design language based upon navigation stick charts utilized by early Marshal Islanders. Design Islands is a physical manifestation of the school of architecture's identity system. Jack Henrie Fisher, together with dean Daniel Friedman, developed a visual identity centered upon a new typeface that overlays the Hawaiian and Latin alphabets, revealing a language within a language. This system was also translated by graphic designer Chae Ho Lee into a identity system for the Building Voices Design Festival. Foundational geometries were derived from the superimposition of both orthogonal and diagonal volumes. A series of rectangular prisms, representing the diversity of systems, ecologies, cultures, and practices of Hawaii’s built environment, were repeated, shifted and re-arranged within the boundaries of a virtual cube determined by the maximum dimensions informed by fabrication and transportation specifications. Horizontal and vertical combinations generated 521 unique variations. Based on the solid/void relationships and number of components, 8 assemblies were selected for fabrication, each representing a main island in the Hawaiian Archipelago: Hawaiʻi, Oʻahu, Maui, Kauaʻi, Molokaʻi, Niʻihau, Kahoʻolawe, and Lānaʻi. Islands can be installed alone or as an archipelago, either indoors and outdoors. A total of 41 individual components make up the Design Islands system. Some of these parts are modular and interchangeable, while others are unique and give each island a different spatial character. Components can be categorized into two main groups: an array of solid volumes that function as both bases and benches; and a series of vertical frames that serve as mounting devices or spatial enclosures. When Design Islands is not on-the-road it is at home in the school of architecture where it is used for student pin-ups and for exhibitions inside the school’s gallery and in the adjacent open-air courtyard. 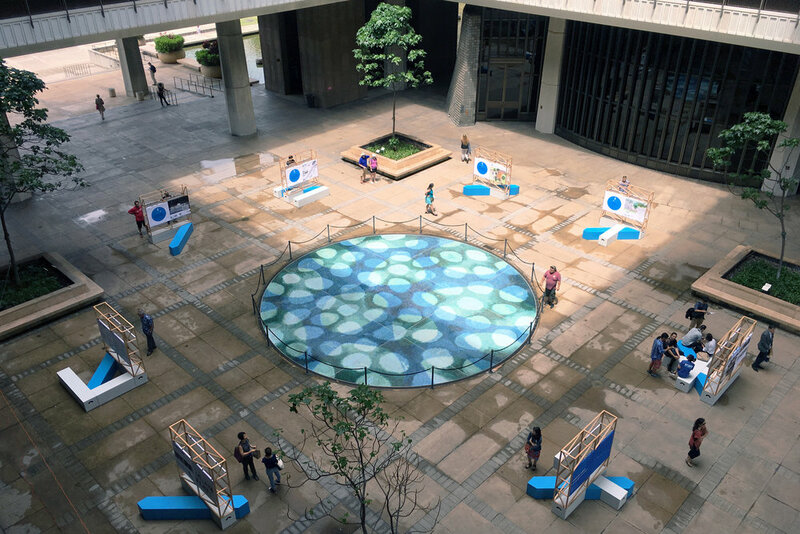 Design Islands is an indoor/outdoor traveling exhibition system intended to invite the community to talk story about design, architecture and critical issues in Hawaiʻi. The Polynesian Voyaging Society invited Design Islands to be part of the welcoming events for the Hōkūleʻa's return to Hawaiʻi. The Hōkūleʻa is a double-hulled voyaging canoe that spent 3 years circumnavigating the globe and visiting 26 countries with the goal of spreading a vision of a shared, global sustainable future. It was initially built by the Polynesian Voyaging Society, with the purpose of re-tracing the steps of early Polynesian navigators. Strawn+Sierralta worked closely with the the University of Hawai’i's Office of the President to design a 'wishing wall' island for the gala that displayed four Hawaiian star lines used by early navigators. Volunteers from Hawaiian Airlines accepted donations at the 'wishing wall' to benefit the Polynesian Voyaging Society’s efforts to advance the Mālama Honua mission with activities that enrich our communities and build a sustainable future. Design Islands was built by a team of over 30 architecture students and alumni from the University of Hawai‘i . This project was ideated, designed, prototyped, and constructed within a period of four weeks. The form, materiality and fabrication techniques used to build the structures were informed by this tight timeframe and by the existing resources available on-island and capacity of the school of architecture's fabrication lab. Detailing includes both hidden and visible joinery, from rabbet, dado and domino wood joints, to adjustable legs and click-in, non-locking hardware. Frames were finished to highlight the natural color of the wood, and in contrast, bases were painted in both light gray (orthogonal components) and cyan (diagonal component) to follow the school’s identity system. Fabrication Team: Crysta Alcantar, Keola Annino, Chloe Bennie, Josephine Briones, Calvin Bulan, Stephanie Cass, Austin Chun, Marcos Cruz-Ortiz, Kathleen Eagan, Tyler Francisco, Christopher Gaydosh, Celeste Guarin, Jason Hashimoto, Kristoffer Jugueta, Creesha Layaden, Jacob Marsicek, Shelby Mendes, Blair Muraoka, Melise Nekoba, Khoa Nguyen, James Noh, Rebecca Ogi, Katherine Pananganan, Jonathan Quach, Gladys Razos, Poutasi Seiuli, Siraj Sheri, Christopher Songvilay, Bryson Tabaniag, Ivy Tejada, My Tran, Morgan Wynne, Kristyn Yamamotoya , Noelle Yempuku, Han Ming Yu. Special Thanks to: Zack Ikaika Bantolina, Tony Cao, Steve Hill, Cathi Ho Schar, Chae Ho Lee, Healoha Johnston, Keala Monaco, Dean Daniel Friedman and University of Hawaiʻi President David Lassner. Organizations: University of Hawai‘i at Mānoa School of Architecture , University of Hawai‘i Community Design Center. Design Islands was supported in part by: The University of Hawai‘i at Mānoa School of Architecture Advancement Fund The Haigo and Irene Shen Architecture Gallery. Design Islands acts as a platform for content and a welcoming setting for visitors to explore a wide variety of issues in Hawai‘i. The traveling installation has been deployed outdoors in the rotunda of the Hawai‘i State Capitol, on the quad at the University of Hawai‘i at Mānoa, in the courtyard of the UHM School of Architecture, and indoors on the roof of the Hawai‘i Convention Center, the lobby of the UHM SoA, and the storefront conference space at AIA Honolulu’s Center for Architecture.